Announcement Welcome to Blooming Door Decor! We believe that home is where the heart is, and we try to convey that feeling through our products. 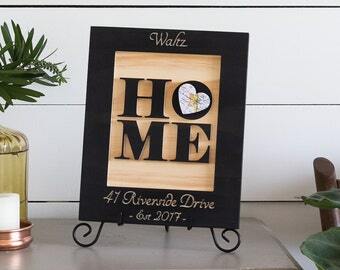 Our housewarming and anniversary gifts enhance the warm, loving feeling of family in your home and help you remember your most special dates. Welcome to Blooming Door Decor! We believe that home is where the heart is, and we try to convey that feeling through our products. Our three-panel silhouette has gotten a serious upgrade. It is now laser-cut from mat board, making the foreground stand out from the background more and it has more detail to it. The text is engraved into the mat so it will never peel or lift. 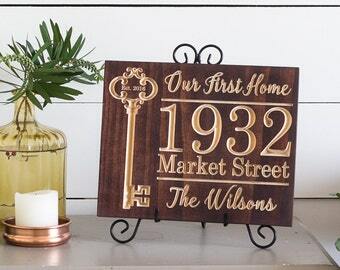 Our wood signs all have an option to have a message engraved on the back! Look for great new photos of all our items in the coming weeks! I never thought of myself as crafty or artistic at all, but when I bought my first home, I just couldn't find any Christmas decorations in the colors and themes that I wanted so I decided to try making my own. I started with painting ornaments, then moved to decoupage, then etched glass - anything that caught my eye. I never realized what a wonderful creative outlet it could be and, once I started, I just wanted to keep trying new techniques and ideas. I've made a lot of things since then, but it wasn't until I started making burlap prints that I considered selling them. I had more ideas than I could fit on my own walls, so my husband suggested giving Etsy a shot. We had such a great experience with Etsy when we were planning our wedding, and it seemed like such a welcoming community that it didn't feel quite as intimidating to open my own shop here as doing it completely on my own would have been. The people on Etsy - both the buyers and the sellers - have been wonderful, and I couldn't be happier with our experience here so far! I live in the Philadelphia suburbs with my wonderful husband of four years and our two kitties. I have been crafting since I bought my first house and realized that I wanted more personalized decorative accents than I could buy at the time. I do all the woodworking for the shop. I also handle many of the admin tasks like marketing and answering most of the customer service questions.